Hillians boss Ian Chapman does not believe a lot has gone his team’s way this season. After surviving relegation on another tense final day for the club, Chapman believes they have not had the rub of the green this year. He said: “The other thing this season more than ever is that we have had not a lot go our way. “We lost a game at Dorking which was ridiculous when we were cruising. Leatherhead a couple of weeks ago we had the ball over the line by a foot and it wasn’t given. “We lost our captain after two games. “Jack Brivio was out for three months. I know every club has their problems but when you are on a limited budget like we are every cog needs to be working. But it hasn’t this year. 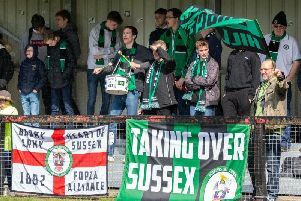 Bowman on the Road: Proud Bostik Premier status is secured, just!